Major mobile device platforms allow users to replace built-in keyboard apps with third-party alternatives, which have the potential to capture, leak and misuse the keystroke data they process. Before enabling the apps, their users should understand the security repercussions of third-party keyboards, along with the safeguards implemented by their developers. Third-party keyboards received a boost of attention when Apple made it possible to implement such apps starting with iOS version 8, though this capability have existed on Android for a while. iOS places greater restrictions on keyboards than do Android operating systems; however, even Apple cannot control what keyboard developers do with keystroke data if users allow these apps to communicate over the network. The primary security concerns related to keyboard applications are associated with their ability to transmit the user’s keystrokes and potentially other sensitive data to developers’ servers. On iOS, this is possible if the user grants the app “full access,” as encouraged or required by the application. The notion of “full access” is equivalent to the term “network access” that Apple’s App Extension Programming Guide discusses when explaining how to build a custom keyboard. According to the guide, network access is disabled by default. Once enabled by the user, this capability allows the keyboard to access “Location Services and Address Book, with user permission,” “send keystrokes and other input events for server-side processing,” and perform additional actions that would otherwise be unavailable. A legitimate keyboard app might send keystrokes to its server to perform intelligent analysis that is best conducted in the “cloud,” such as predict upcoming letters, store user typing patterns or perform large-scale lexicon analytics. Some third-party keyboards will function without their users granting them “full access;” however this will disable some of the features that might have drawn the users to the app in the first place. Users of third-party keyboards should not count on mobile OS providers to enforce security practices on server-side keyboard data processing. Instead, they should decide whether they trust the keyboard developer with their data, perhaps on the basis of their perception of the developer’s brand and public security statements. Even if the keyboard developer intends to safeguard the data their app captures, there is the possibility and a bug in the implementation or design of the keyboard will inadvertently expose sensitive data. For example, in July 2016, some SwiftKey users reported that “that their keyboards were populating with other people’s email addresses and searched phrases.” This might have been caused by SwiftKey’s language model improperly cross-pollinating the terms learned from one user to others. SwiftKey didn’t offer much of an explanation for this issue beyond a terse statement. I looked at the security and privacy statements published by the developers of three popular keyboard apps that are available for mobile devices: SwiftKey, Gboard, Fleksy and Swype. Their developers differ in their explanation of how the safeguard users’ data. SwiftKey, which is now owned by Microsoft, publishes a high-level overview of its data security and privacy practices. For users who opt into the SwiftKey Cloud feature of the product, the company collects “information concerning the words and phrases” that users utilize. The company calls this Language Modeling Data and explains that it is used to provide users with “personalization, prediction synchronization and backup.” Fields that website or app developers designate as denoting a password or payment information are excluded from such collection. SwiftKey states that the data transferred to SwiftKey Cloud is transmitted to their servers “over encrypted channels” and is stored in a “fully encrypted” manner. The company also points out that its data protection practices are governed by “stringent EU privacy protection laws” and mentions the (now weakened) Safe Harbor principles. The company also states that data of users who don’t enable SwiftKey Cloud is not transferred out of their devices. 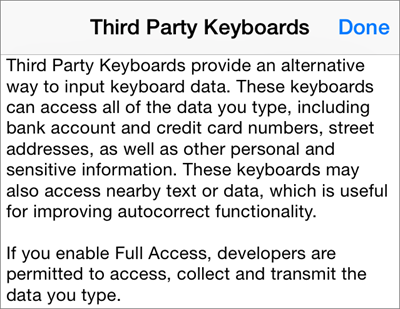 Unfortunately, SwiftKey on iOS doesn’t function at all until the user grants it full access. 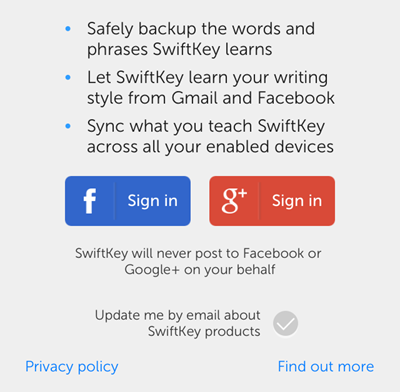 The user needs to trust SwiftKey that they won’t send data off the mobile device unless SwiftCloud is enabled. 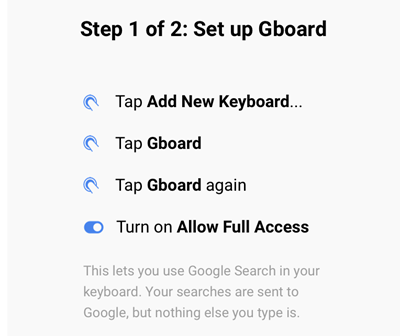 The most attractive feature of Google’s Gboard keyboard is probably the web-searching interface, which allows its user to submit search queries to Google without explicitly switching to a web browser. “Your searches are sent to Google’s web servers to give you search results. The company’s CEO Olivier Plante made a public commitment to protect users’ privacy, stating that the company “purposefully built our technology and algorithms to remain processed locally, and never rely on server-side personal data processing.” He pointed out that while most of Fleksy’s competitors make money by mining user data “for various purposes such as advertising,” personal voice assistants and so on, the company’s business model is based on the purchases users make inside Fleksy’s app. The users need to trust the keyboard developer not to capture keystrokes and other sensitive data beyond Language Modeling Data. Doing this could be done on purpose by a malicious keyboard app or by accident by an otherwise benign application. 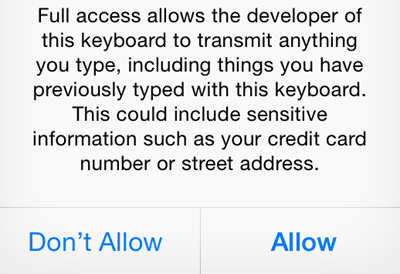 In this case, the keyboard could act as a powerful keylogger for the mobile device. Users might assume that the guardians of their mobile OS, be they Google, Apple, Samsung, etc., might protect them from malicious or accidental misuse of keystroke data and network access. However, such firms have no direct control over what happens once the data leaves the mobile device. Keyboard developers should provide additional details about their security practices to reassure users and consider how their apps might provide innovative features in a manner that minimizes users’ risk and the apps’ need for network access. It’s unclear why SwiftKey cannot function (at least on iOS) without network access, why Fleksy doesn’t make it easier for users of its app to understand when data is sent to the company’s servers and why Nuance doesn’t discuss any of these topics for its Swype keyboard on its website. I discussed this topic on the Science Friday radio show in the second half of the segment called Tracking the Hidden Trail Left by Your Smartphone. The article was originally published in September 2014, and has been updated periodically to reflect additional app and risk details.